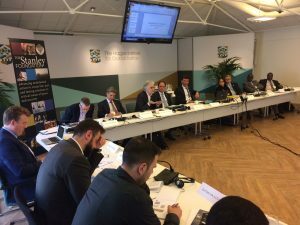 On April 13-14, 2017, the Auschwitz Institute for Peace and Reconciliation (AIPR), the Stanley Foundation, the Global Centre for the Responsibility to Protect (GCR2P), the Montreal Institute for Genocide and Human Rights Studies (MIGS), and the Hague Institute for Global Justice (THI) co-organized a two-day event entitled “Global parliamentarians: The role of the legislative branch in building national mechanisms for atrocity prevention.” The meeting brought together more than 25 current and former Members of Parliament (MPs) and parliamentary staff from around the globe with policy experts and representatives of civil society to discuss the critical responsibilities that parliamentarians have in the prevention of mass atrocities. The event’s agenda and participant list can be accessed by clicking here and here, respectively. To facilitate productive discussion, the framework of the meeting was built around the three central roles Members of Parliament play in the prevention of mass atrocities in all regions of the world. First, Members of Parliament are responsible for the development of legislation and initiatives at the national level, including the provision and allocation of resources for activities towards the prevention of mass atrocities. Second, MPs are able to advocate on behalf of human rights issues, both at home and abroad, that are often identified as risk factors, which increase the probability that countries or regions will experience mass atrocities. Third, parliamentarians are responsible for overseeing the effective implementation of atrocity prevention policies at the national level. Beyond these three roles, the participating parliamentarians discussed the importance of National Mechanisms for Atrocity Prevention. The meeting was comprised of presentations by policy experts and prominent officials involved in atrocity prevention at the international level, as well as panel discussions including both parliamentarians and representatives of civil society. Following each programmatic segment, the floor was opened for discussion among attending MPs and other participants to engage in a robust dialogue on the themes at hand. After introductory comments made on behalf of the event’s organizers, Dr. Jennifer Welsh, Professor and Chair in International Relations at the European University Institute and former UN Special Adviser on the Responsibility to Protect, delivered a keynote address, highlighting the need for action on atrocity prevention and the Responsibility to Protect at the national level, especially in consideration of the destabilizing forces currently at play around the globe. Ambassador Stephen Rapp, former United States Ambassador-at-Large for War Crimes Issues and Fellow at The Hague Institute, delivered remarks on legal considerations and responses to mass atrocities. He discussed the history of prosecuting atrocity crimes around the world and gave participants insight into the manner in which legal responses fit into broader strategies for prevention and how the work of parliamentarians can support them. Caroline DuLaney and Jai-Ayla Sutherland, representing the Stanley Foundation, followed Ambassador Rapp, provided an explanation and overview of the materials provided to attendees which highlighted the role of legislators in creating structural resiliency in society. They also discussed the First Response materials provided and underscored the vast array of non-coercive response tools available to States leaving kinetic military responses to the mass atrocities as a matter of last resort. The Stanley Foundation has created a resource page containing a number of the materials provided during the program that can be accesses here. Ms. Savita Pawnday, Deputy Executive Director, Global Centre for the Responsibility to Protect, gave a presentation on best practices for parliamentarians, highlighting examples of action and inaction. Ms. Pawnday presented research the Global Centre produced for the meeting entitled, Advocate, Educate, Legislate: The Role of Parliamentarians for Mass Atrocity Prevention, which can be found here. 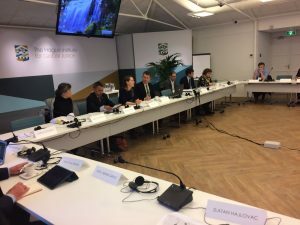 Her presentation drew special attention to circumstances in which stronger parliamentarian action could have made a critical difference in preventing atrocities, putting forth a framework for action for legislators. The United Nations Special Adviser on the Responsibility to Protect, Mr. Ivan Šimonović, made remarks on the important role of parliamentarians in holding their government accountable in matters related to atrocity prevention. The Special Adviser sees this role manifest in three important areas: legislation, related to both direct prevention initiatives and indirect ones such as systemic discrimination; budgetary debates and allocations, making sure that sufficient resources are going towards prevention; and oversight and participation in government initiatives to ensure that prevention remains at the top of the national agenda. The subsequent discussion panel, chaired by former Canadian MP Paul Dewar, focused on the topic of advocating for prevention as a parliamentarian, and included Chritoph Stässer MP from Germany, Eli Ehsassi MP from Canada, John Denham Former MP from the United Kingdom, and Paulo Teixeira MP from Brazil. This panel highlighted successful parliamentary initiatives that have succeeded in moving mass atrocity preventions issues to the forefront of their respective parliaments’ work. Dr. Tibi Galis, Executive Director of the Auschwitz Institute, delivered a presentation on National Mechanisms for Atrocity Prevention. Dr. Galis gave an overview of National Mechanisms and described the vital role that parliamentarians play in the construction of durable mechanisms on the national level and in encouraging and supporting their construction in other countries throughout the world. The module included case studies of Kenya’s National Mechanism: the Kenyan National Committee for the Prevention and Punishment of the Crime of Genocide, War Crimes, Crimes Against Humanity and All Forms of Discrimination and the United States’ Atrocity Prevention Board, supported by Kenyan MP Kenneth Okoth and the Hague Institute’s Dr. Eamon Aloyo, respectively. To see AIPR’s third annual report on the National Mechanisms and their intersection with parliamentary engagement please click here. The event’s second day commenced with a discussion chaired by MIGS’ Kyle Matthews on the role of the executive powers and their relationship with the legislative branch of government in the design and implementation of atrocity prevention. This panel included Elke Koning, Acting Head of the Political-Legal UN Team of the Ministry of Foreign Affairs of the Kingdom of the Netherlands who highlighted Dutch efforts for supporting the rule of law and the R2P and Ambassador Pou Sothirak, Executive Director of the Cambodian Institute for Cooperation and Peace. This was followed by a discussion chaired by representatives of the Stanley Foundation dedicated to covering ways to connect legislators with regional and global institutions, featuring Dr. David Cattin, Ana Gomes MEP from Portugal, Benjamin Abtan, and Ismail Wolff. Before the event wrapped up with a concluding discussion period, a workshop module was convened to allow participating parliamentarians to discuss region-specific challenges and approaches to atrocity prevention with their regional counterparts from neighboring countries. The successful event worked to reinforce the importance of informed debate among parliamentarians on mass atrocity prevention at the national, regional, and international levels. Discussions highlighted strategies for moving measures for prevention through the legislative process, the role of MPs in holding their government accountable, and methods for increasing cooperation between National Mechanisms and national and regional parliamentary bodies, as well as ways in which regional MPs can collaborate in efforts for durable frameworks for prevention. 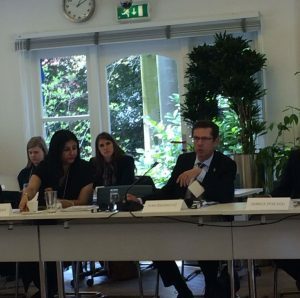 For more information on the Global Parliamentarians Meeting and the Auschwitz Institute’s work with national-level initiatives for atrocity prevention, such as National Mechanisms, please contact Jack Mayerhofer at jack.mayerhofer@auschwitzinstitute.org.